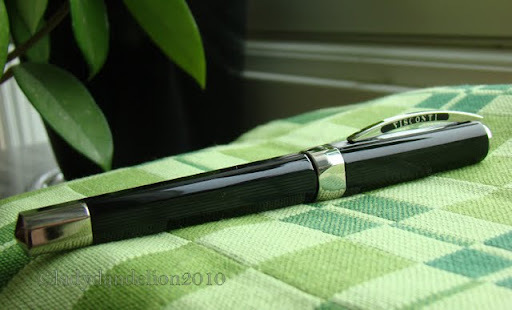 I took some photos of the Visconti Opera for the sale and…it is such a beautiful and pleasant pen. But, I have overindulged a little too much lately. So… the pen in the pics must go and this is the green goodbye suite…enjoy! 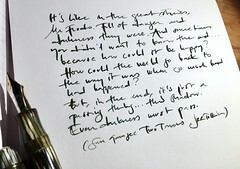 This entry was posted in fountain pens, pens, photo, visconti, writing and tagged fountain pens, pens, photo, visconti. Bookmark the permalink. 5 should have items consist of, pen, mentos, lip gloss, iphone and kleenex! Lovely pen – quick sale too. Such a beautiful pen, it’s a shame that you had to let it go. I actually purchased one of these last week after admiring it on your blog, I can’t wait to receive it! …aren’t they and it just! Hope the sale balances out the recent YOL purchases.